The double chin, or what is known medically as “submental fat”, is a common problem brought to the attention of cosmetic surgeons every day. In fact, a 2014 survey by the American Society for Dermatologic Surgery cited that 68% of respondents call a double chin their top concern in their practices. The approval of the drug Kybella™ in May 2015 as a non-surgical injection specifically for this area has gotten many people with double chins to take notice. There are, however, other proven treatments that have been around for a long time which also work very well. Keep in mind that not all double chins are the same and many people who think they have double chins may actually just have conditions such as loose skin under the neck, banding from neck muscles (platysmal bands), or have large volume of fat from being overweight. Many people are concerned about “double chins” and are considering Kybella™. 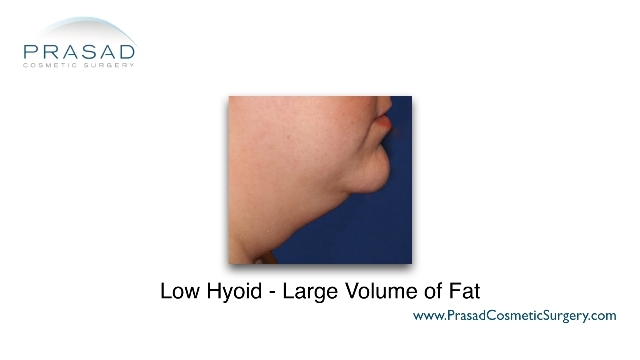 Half these people do not have chin fat or have other diagnoses. Only one person shown here is candidate for Kybella™ treatment because she has a double chin with a limited amount of submental fat. Kybella™ is a non-surgical injection designed specifically for the treatment of double chins caused by submental fat. Its active ingredient is deoxycholic acid which can reduce submental fat. Kybella is only FDA-approved for fat present below the chin and is not for any other areas of the body. Kybella™ is injected into under chin fat called submental fat and works by destroying subcutaneous fat cells. Once these fat cells are destroyed, they can no longer store or accumulate fat. Its active ingredient, deoxycholic acid, is also naturally produced by the body in the bile to help in fat absorption. Patients who undergo Kybella™ may need more than one treatment. While the exact number of treatments and injections are dependent on the way patients respond to the treatment, preliminary studies show that up to 6 treatments may be necessary, and up to 50 injections needed per treatment. While a non-surgical solution certainly sounds more appealing, the amount of treatments and injections needed may make Kybella™ difficult for patients to maintain. How Do I Get Kybella™ Treatment? While Kybella™ is already FDA-approved for use by licensed cosmetic surgeons and dermatologists, the drug will not be commercially available until June 2016. I advise that you book Kybella™ treatment only with doctors who are experienced with other facial procedures such as surgical facelifts, neck lifts, facial liposculpture, and non-surgical facial injections like Botox and Restylane. Cosmetic surgeons are able to give both non-surgical and surgical recommendations for the best results possible. A small layer of fat is healthy for the skin and provides a youthful look. Not all fat is bad. Patients and doctors must be conscious of maintaining a small layer of fat between the skin and soft tissue of the chin. Not only does this give youthful volume, but fat has stem cells needed for skin renewal and collagen generation. While Kybella™ does hold a lot of promise when it comes to treating double chins, its effectiveness and ease of application have yet to be proven on the general public. Liposculpture is perceived to be an invasive procedure, but having a micro cannula not much larger than a needle for injection for submental fat removal is generally successful in only one session. This is in comparison to numerous Kybella™ injections made during several treatment sessions. In the end, more time and more treatments are needed with Kybella™. Liposculpture to treat double chins is a tried, tested, typically one time treatment. Results for facial liposculpture (facial lipo) are predictable, and patients do not have to wait for results to show before having another treatment session as results can be seen immediately. 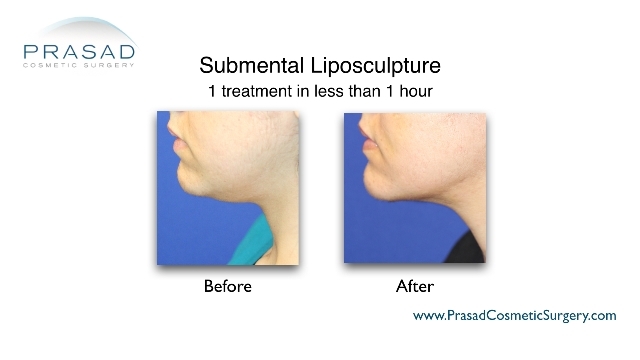 Submental fat can be treated with facial liposculpture in under an hour in only one session. Submental fat can collect in a larger volume in people who are overweight. People who have a larger volume of fat in general may have too much submental fat that can be effectively treated with Kybella™. The number of injections and repeat sessions will likely be frustrating for the patient and the physician. It’s likely that there will also be irregularities in the skin in between sessions due to the volume of fat present. Overweight people may not be candidates for Kybella™ right away, but it doesn’t mean they cannot eventually become candidates. 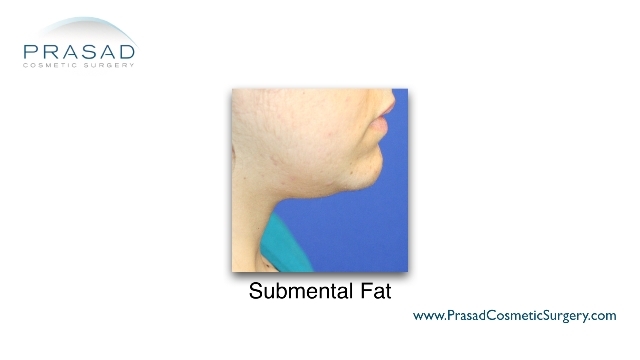 Reduction of submental chin fat should take place first by means of losing weight through proper diet and exercise. When diet and exercise can no longer reduce remaining submental fat, then Kybella™ can be considered on the smaller volume. Some people may also mistake other issues for double chins such as excess, sagging skin. 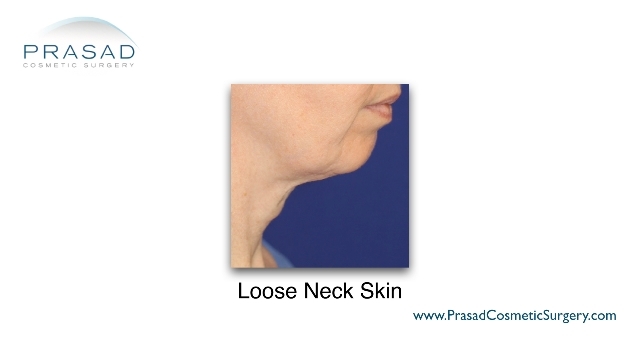 Loose neck skin is due the descent of skin due to facial aging, not submental fat. Loose skin under the neck is due to the gradual sagging of facial skin due to aging, and also the weakening of the soft tissue layer under the skin that communicates with neck muscles called the SMAS (superficial musculo aponeurotic system). When the skin sags and SMAS weakens, the only solution to this is a facelift, or a face and neck lift. 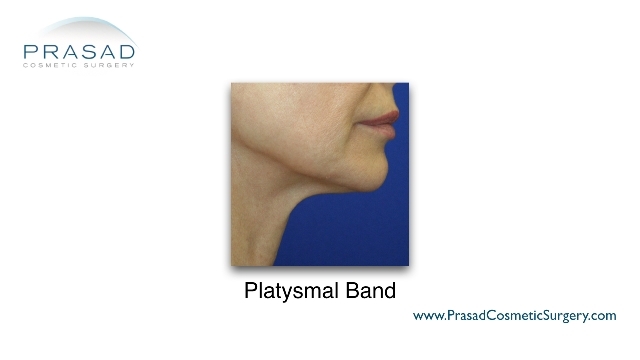 Platysmal bands refer to the neck muscles called the platysma that have pushed forward or become loose due to normal facial aging or surgery. This problem is best treated with a platysmaplasty to reduce the protrusion and appearance of these bands. Platysmal bands protrude from the neck due to normal facial aging. A surgical procedure called a platysmaplasty can improve this appearance. Side effects reported by a small minority of patients during Kybella™ trials include: bruising, swelling, redness, nerve injury that caused temporary facial weakness, and pain. Most of these side effects are also reported in other facial injections such as filler application. Contact us today to inquire about treating your double chin.